Ski-Doo is a brand nestled under Bombardier, existing as one of the most renown snowmobile names in the world. Originally appealing to those traveling on Canada's snowy terrain, Ski-Doo is now beloved by sports enthusiasts, seen as a motorsport company with its lines of powerful and capable snowmobiles. We are proud of offer a full line of Ski-Doo OEM parts scaling from the newest models to those manufactured in the late 1990s. No matter which Ski-Doo you own, we've got the right parts to repair it. If your Ski-Doo was produced in 2010 or later, we have everything you'll need to successfully replace parts to get back out in the snow once more. Whether you own the Summit 600R E-TEC, MXZ 900 ACE, Tundra Sport 550F XU-137, or Renegade X 1200, we have all the right Ski-Doo parts to get yours back in top condition. From arms and hoods to batteries and suspensions, find what you've been looking for here in our wide-ranging inventory. Was your snowmobile manufactured in 2009 or earlier? If so, we also carry a huge array of parts for these Ski-Doos. We've got parts for models like the Legend Touring, Freestyle Session 300F, Skandic LT 440F, Mini Z, Formula Deluxe 500 LC, and many more. From simple to challenging repairs, we have the parts you need. From carburetors, starters, electrical systems, seats, decals, and other essential OEM selections, we stock the Ski-Doo parts that your snowmobile needs to run smoothly. Own a classic Ski-Doo? 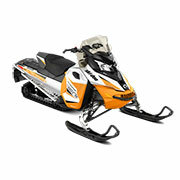 At Can-Am Parts, we've got the parts for these foundational snowmobiles! No matter which model you have—the Mach Z, Tundra R, Formula S, or Elan 247—the parts required to restore your snowmobile can be found here. If your Ski-Doo has been tucked away in storage, we can help bring it back to life! From brakes and engines, to steering systems and frames, we've got you covered. If you know the exact Ski-Doo part number that you're searching for, use our convenient OEM Part Search tool. Simply enter in the number and model and be ready for checkout in minutes. Whatever you need for your Ski-Doo snowmobile, you can find it here—guaranteed!